The 2010 London Book Fair introduces a Comics Pavilion and a day of seminars on Tuesday April 20th. From 2.30-3.30pm, I will be joining a panel discussion with science fiction author, activist, journalist, blogger and co-editor of Boing Boing, Cory Doctorow, David Fickling from The DFC and DFC Library, Emma Hayley from SelfMadeHero, and crime novelist and graphic novelist Ian Rankin on the digital futures of graphic novels and manga. 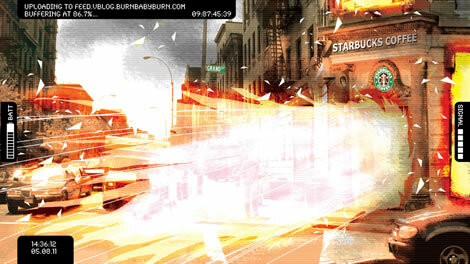 Here are a few of my speculations about where digital comics may be taking us. Some have wondered whether the proliferation of digital comics over the last few years, on the Web and via mobile phones, iPhones and other platforms, has been a force for good or evil. I believe it has been almost entirely for the good, above all because it’s enabled creators to take control of their work and get it to their readers with the minimum of middle-men. As with any proliferation of a medium, Sturgeon’s Law will apply and only a modest percentage will be really good. Still, the more there is, the more good work can exist within it. The lack of much if any editorial input and the mostly unhindered license to produce new episodes day after day can result in spontaneity and immediacy, and a welter of diaristic, even diarrhetic, blog comics. On the downside, it can also sink into overindulgence and blinkeredness. Some successful but, to my mind, verbose and self-satisfied webcomics could do with an editor’s guidance! That said, I do feel digital comics represent an opportunity to expand the language and vocabulary of the comic form beyond former traditional print restrictions. Digital comics offer the chance for comics to be liberated from print and paper and you might think there would be a vast variety of shapes and forms to them. 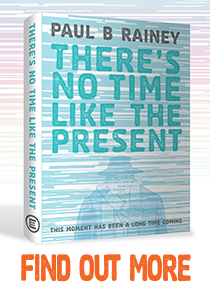 What Scott McCloud has called “the infinite canvas”. It seems in fact that the majority of digital comics either still use a set “page” format as their unit, or are based on that system, and seem intended for eventual book compilation, albeit in sometimes unconventional formats like Dash Shaw‘s upright Bodyworld collection. 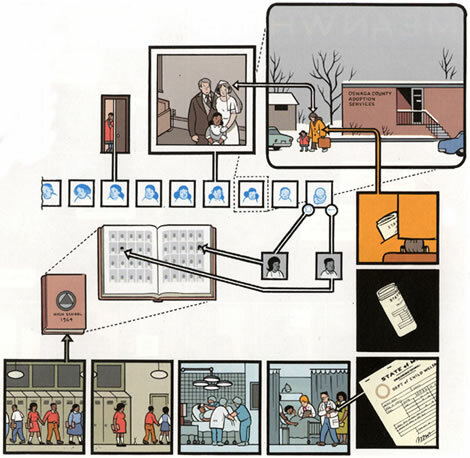 But I am convinced that comic layouts and language such as that of Chris Ware would not have been comprehensible to all that many people before the advent of the internet and the way it has radically changed how we read and look at text and icons and navigate pages and signs. Just as the arrival of cinema transformed the public’s processing capacities and comics themselves in the late 19th century, in America’s newspaper strips and elsewhere, so now a century or so later, the internet is having a similar, perhaps greater transformative impact on the medium and its readership. The question remains how do creators of webcomics get their material to stand out and be noticed. There is such profusion of choices that many people may already feel they are at overload. Discrimination is something we all have to do, choosing what to take an interest in, devote time to. And who can blame anyone for preferring to stick with what they know and enjoy, to see comics as a comfort zone of familiar genre tropes and mass-market formulas? But for those who are curious and looking for something more personal, maybe idiosyncratic, artistic, experimental, there’s a need for critics, guides, filters, arbiters, to help people track down and find a way into the very best of this sort of work that’s out there. I like to think that is partly what my books, site, exhibitions and festivals try to do. Another issue is that webcomics can save creators from expensive print and distribution costs, but can they earn a living solely from producing comics online? The fact that so much on the web is free has led most people to expect everything for nothing and baulk at paying out. The model for making money is proving so far to be less from the online forms of the comics, and more from their subsequent print forms. Some punters may be quite happy with their virtual comics, but others still want the tangible, paper-printed version. In that sense, internet comics can promote and build up a truly global audience for your work which would have been so much harder previously. It’s certainly allowed mainstream artists like Cameron Stewart to hone his skills as a writer and devise the sort of comics he wants to do, independent of the work-for-hire illustration that pays the bills for the floundering superhero-fixated Marvel/DC universes. It’s an escape plan, essentially, investing time and effort now to seed a new creative path that could grow into a solo career. And there are success stories like John Allison’s Scarygoround, a thriving online “cottage industry”, or the games-fixated, fan-friendly PvP or Penny Arcade which boast huge followings. The digital revolution, however, is moving so rapidly and in such confusion, driven by market forces and without consulting the authors, that the fundamental business model has not yet been entirely worked out. In France and Belgium almost every publisher has launched their own online catalogue and portal, while some license their titles to subsidiaries or third parties. 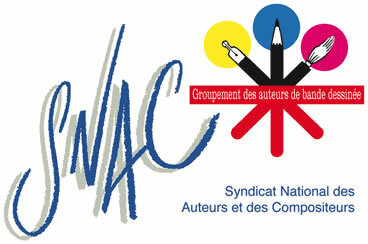 It is getting out of hand, so much so that fifty top creators of French comics, including signatures from Trondheim, Sfar, Berberian, Cestac & Vehlmann, have formed a special comics group, GABD, as part of the authors’ union SNAC, and on March 20th, launched it at the Paris Book Fair, they signed a landmark petition in protest. They want to insist that publishers involve them in the digital adaptations of their copyrighted works. “Is distributing a comic on a mobile phone or on a computer screen the same as distributing the original work… or its adaptation… or a spin-off work?” “In view of fact that there has been not the slightest consultation, while the publishers quietly set up a market along the lines that are the most profitable and convenient for them”, these undersigned BD auteurs officially refuse to authorise any digital exploitation of their works. The GABD is calling for a working group to be set up under the Ministry of Culture made up of authors and publishers which can “identify and promote fair practice, guarantee that changes in technology must be matched by changes in terms of contractual rights, and that payments remain in proportion with the success of the distribution and consumption of our works, however they are adapted…” The GABD’s numbers have shot up to over 600. It’s all coming to a crossroads now and clearly these issues need to be addressed and resolved fairly for all concerned. SelfMadeHero is digitising its Manga Shakespeare range and did a classy blend of comics and music adapting Reinhard Kleist’s Johnny Cash graphic biography. Even Disney’s Education programme is getting in on the act by commissioning classic superhero artist Neal Adams to illustrate a Motion Comic about the Holocaust. But am I not alone in wondering when does a comic stop being a comic and start to become cheap, unanimated animation - or “unanimation”? Shouldn’t part of the pleasure and reward of a comic be that the reader/viewer is in full control of the experience, and is not subject to its set duration and pacing as in passively watchng a movie or play? Comics, like books, invite you to pause, to look back, to look ahead, to take whatever time and direction you choose. On the other hand, another form known as “Hypercomics”, where stories can have multiple pathways, directions and options, offering far more intriguing potential for the medium - as the exhibition I am curating at The Pump House Gallery, Battersea Park, London this summer with genius innovator Daniel Merlin Goodbrey (yes, that really is his middle name) will demonstrate! 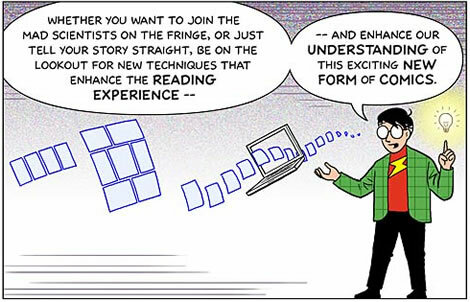 Daniel usefully defines Hypercomics as “a comic with a multi-cursal narrative structure. In a hypercomic, the choices made by the reader may influence the sequence of events, the outcome of events or the point of view through which events are seen.” Joining him will be three other artists, one per floor: Dave McKean, Warren Pleece and hopefully Adam Dant. For examples of some of the new, almost three-dimensional configurations which Hypercomics can take, check out Goodbrey’s site E-merl.com where you can also try navigating the prophetic PoCom or Potential Comic made by a host of artists including Tom Gauld and Chris Ware for the very first Comica Festival back in 2003. PoCom or Potential Comic: Read it online. These days, other devices and their apps are offering different digital delivery platforms, from regular mobiles to the iPhone and iPad. I’ve tried one or two apps, such as Ave! from France, and I hear ComiXology, Comic Zeal and ClickWheel offer some snappy solutions. I am sure some excellent new e-readers and e-books will come along soon and offer further enhancements of the sort of comics-reading apps we’re seeing today. Clearly if all you see are single panels, one at a time, one after another, and never see the bigger picture of the whole page or spread, or at least a larger cluster or shape of panels, that does alter how you decode a comic quite fundamentally. 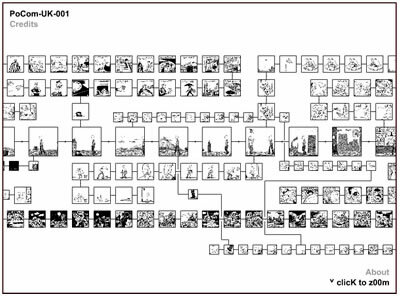 Comics are much more than merely one panel at a time, they are the networks and systems between panels, forward, backward, on the same page and throughout the whole story. Of recent entries, I am much more interested in Dan Goldman’s Red Light Properties, an online exclusive financed by Tor Books. Here he has cunningly broken down panels and balloons into timed steps which the reader/viewer can click through and determine in his webcomic serial. Another brought to my attention is Valentine by Alex de Campi and Christine Larsen, a compelling supernatural thriller set during Napoleon’s retreat from Russia, told across one full-screen panel at a time, showing the unobscured artwork first before the text appears with the second click. Its cleverest innovation is its availability in no less than 14 (so far) different languages. Both strike me as very promising ways forward. I’ve also just stumbled upon my first Facebook comic, in French, an almost obvious way of using the clickable Photo Album section to line up a whole story by Marco Lataste. Whatever next? My suspicion is that we are still at the dawn of what digital comics can do and will become. They have the potential to radically transform the medium in ways we’re only just starting to explore. Are any of us prepared for what Comics 2.0 or 3.0 might bring?